With a sleek rectangular pool surrounded by a cantera-stone wall, gurgling fountain, and outdoor fireplace, the seven-story Hotel Encanto appeals to both families and couples seeking an urban resort vibe. Amenities include a festive Garduño’s restaurant, the swanky Azul Ultra Lounge and Nightclub, a spa offering body wraps and massages, and a good-size fitness room. A few blocks from the captivating Old Mesilla Plaza, you’ll find a more intimate, homey lodging option, the reasonably priced Casa de Rosie. This rambling adobe compound anchored by a redbrick courtyard contains three guest rooms, including a detached casita with a fully stocked kitchen. Southern New Mexico’s hub city erupts with activity in early autumn. Fiesta season in Las Cruces starts with the New Mexico Wine Harvest Festival (Aug. 30–Sept. 1) and continues with the White Sands International Film Festival, which kicks off its fiveday run on Sept. 3. Cinephiles can get a head start at the 48-Hour Film Frenzy, Aug. 30–Sept. 1. The weekend of Sept. 13, history buffs can salute both sides of the border: At Fort Selden, Frontier Days re-creates life at a 19th-century Army outpost, complete with cavalry horses and artillery demonstrations, while revelers at Mesilla’s Diez y Seis de Septiembre Fiesta celebrate Mexican independence. To wrap up the month—and smother it in chile—check out the Whole Enchilada Fiesta, where booths and a parade spill into the city streets (Sept. 26–28). The Southern New Mexico State Fair & Rodeo kicks up dust and glitter Oct. 1–5, and the Mesilla Jazz Happening (Oct. 4–5) hits some soulful notes. Late in the month, the American Southwest Theatre Company’s 2014–15 season raises the curtain at New Mexico State University’s spectacular Center for the Arts, which debuted at the end of 2012. ASTC will present West Highland Way, by accomplished young playwright Meridith Friedman, from Sept. 25 through Oct. 12. Beyond all the dynamic festivals and outstanding museums, this fast-growing city and its richly restored Old Mesilla neighborhood offer visitors much to see and do: a dramatically reinvigorated downtown; up-and-coming galleries, wineries, and cafés; and easy access to the nation’s most recently designated national monument, Organ Mountains–Desert Peaks. Begin your weekend adventure in the Old Mesilla district, which dates to the early 1850s. Its stately brick-and-grass plaza, surrounded by mostly Territorial-style adobe buildings, contains art galleries, gift shops, bars, and restaurants. The 162-year-old Basilica of San Albino casts long shadows upon the north end of the plaza, while a block south and east, you can toast your arrival with margaritas, green-chile-smothered steaks, and rolled tacos at atmospheric La Posta de Mesilla, which occupies an 1840s Butterfield stagecoach station. Alternatively, venture a few blocks north to sample exceptional wines, creative thin-crust pizzas, and house-made gelato at Luna Rossa Winery & Pizzeria, which specializes primarily in old-world Italian varietals, including a much-celebrated Nebbiolo Reserve that pairs perfectly with the Messicana pie (topped with mildly spicy green chiles, prosciutto cotto, and tomato sauce). If you haven’t been to downtown Las Cruces in a couple of years, you may be surprised to see that Main Street—which had been awkwardly reimagined as a pedestrian mall following a well-intentioned but ultimately off-putting urban renewal effort in the early 1970s—has been restored to its former glory, with the resumption of auto traffic, the installation of tree-lined sidewalks, and the opening of a state-of-the-art home for the family-friendly Las Cruces Museum of Nature and Science. Arrive early on Saturday morning to check out the more than 300 vendors who sell their goods at the Las Cruces Farmers’ & Crafts Market, from 8:30 a.m. to 1 p.m. (The market is also held during these same hours on Wednesdays.) You’ll find everything from handcrafted copper earrings and bracelets at New Mexico Metalwork Art to Kurt Van Wagner’s vibrant framed landscape and still-life photos at Digital Art by Kurt, not to mention local pecans, flowering plants, pumpkin bread, juicy apples, sourdough bagels, and heirloom tomatoes at the food stalls. For a memorable sit-down meal, before or after the market, stroll a few blocks east to La Nueva Casita, a fixture downtown for nearly 60 years. The chile relleno omelets and tacos estrellas (stuffed with seasoned pork and beef) both draw raves. 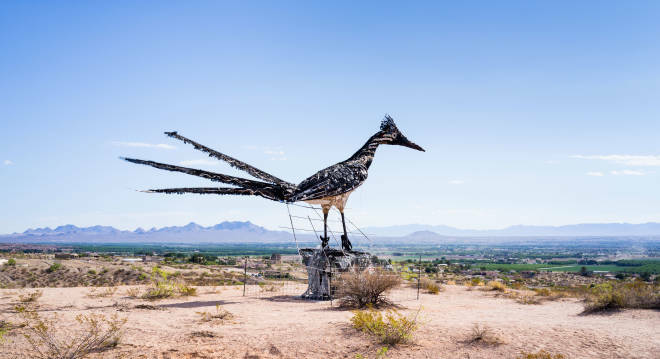 Back on Main Street, you could easily spend another two or three hours touring the aforementioned science museum, the Las Cruces Museum of Art, and the adjacent Branigan Cultural Center—the latter two each host engrossing rotating exhibits. The handsome 1935 Pueblo Revival Branigan Center also displays a fascinating permanent collection of photos and artifacts that document the history of the Mesilla Valley. Several art galleries now thrive along or near Main Street, too. If you’re in town the first Friday of the month, attend the Downtown Art Ramble—local shops and galleries hold openings, serve refreshments, and present live music from 5 until 7 p.m.
Later that afternoon, return to Old Mesilla for more shopping and gallery hopping, followed by a leisurely dinner. Two of the neighborhood’s most alluring businesses occupy a strikingly contemporary complex a few blocks north of Mesilla Plaza. LuLu carries a discerning collection of eye-catching home accessories, jewelry, women’s fashion, kitchenware, and offbeat gifts. Next door, stylish Savoy de Mesilla turns out stunningly plated contemporary American fare, such as pan-seared duck breast topped with a cherry-port reduction, and a showstopping liquid-nitrogen Tahitian vanilla ice cream for two, prepared table-side. Kick off the day in Old Mesilla with either a quick bite to eat (rich, house-roasted coffee, hearty breakfast burritos) at the cheerful Bean Cafe, which occupies a circa-1940s former gas station, or a more substantial morning repast on the landscaped patio of Josefina’s Old Gate café, where a bowl of green-chile posole or a platter of chilaquiles topped with scrambled eggs and red-chile pork will provide plenty of fuel for a day of exploring the region’s wild—as in outdoorsy—side. Next, drive five miles east to the New Mexico Farm and Ranch Heritage Museum, whose 47 acres of indoor and outdoor exhibits and demonstration areas appeal clearly to kids of all ages but also capture the interest of adults. Vintage wagons, farm tools, household goods and clothing, and folk art tell the story of Southwestern agriculture during its heyday, from about the mid-19th to -20th centuries. Outside on the museum grounds, you can wander among antique tractors, a pistachio grove, and a soaring 1930s windmill, and visit with dairy and beef cattle, goats, sheep, and other livestock. Pick up New Mexico wines, light lunch fare, and ice cream at the museum’s Eagle Ranch Mercantile and Snack Bar. From the museum, continue about nine miles east along mostly unpaved but well-maintained Dripping Springs Road toward the soaring, jagged peaks of Organ Mountains–Desert Peaks National Monument to reach Dripping Springs Natural Area. In these tranquil foothills, stop by the visitor center for maps and advice before embarking on the easy 3.4-mile-round-trip gravel trail that snakes past abandoned but surprisingly intact hotel, sanitarium, and camp buildings. You can enjoy Dripping Springs in a couple of hours, allowing plenty of time to begin your return drive, but if you’re able to, time your hike to end just as the sun is setting—the views to the west from the parking area are stupendous.